When I became a Shike(Grand Master), several people told me, "You do not have to practice with this now." However, the Shike(Grand Master) is an obligation, not a goal. It's not the end, it's not the summit. The world of GEI (芸-Japanese Traditional Accomplishments) is the same. If you decide the end by yourself it will be enough, and if you do not set the end, you can taste the lesson until you die. 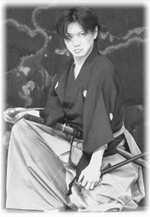 If you can not run without a definite goal, it is difficult to keep Traditional martial arts. Rather it is better not to run, keep walking all the way. Of course, it is wonderful to set a goal for each and achieve it steadily. It is not to be denied. To quit on the way is not to be denied. I walk a long way because it is pleasant, I am merely self-satisfied. So for me, continuing practicing is not proud. And it is not something to force people into. Copyright © 天心流 第十世師家ブログ All Rights Reserved.